It’s on for young and old. Let’s get Seniors week on the TV this year with a flash mob for all ages from teens to centenarians!!! Are you ready??? 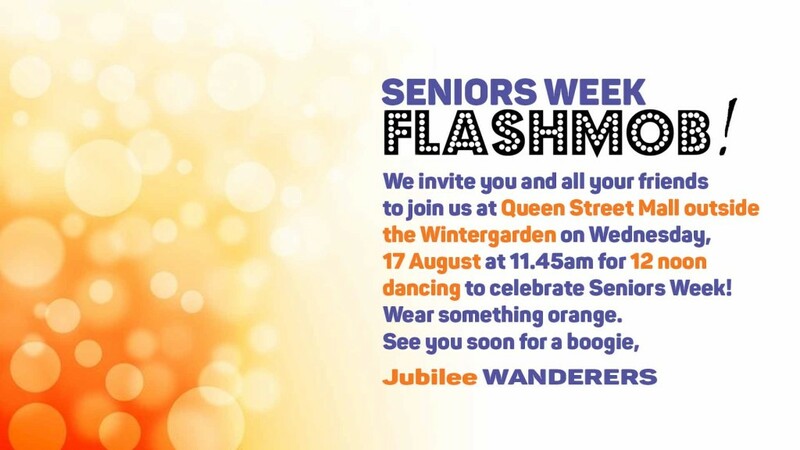 The Jubilee Wanderers, activities group organised by local not for profit aged care service provider Jubilee Community Care, are inviting you to join them with a really easy routine to flash mob Brisbane’s Queen Street mall outside the Wintergarden at 12 noon on Wednesday 17 August. …it’s going to be so much fun! Come and have a little boogie and if you want to show off for the cameras (safely) we encourage that too! If you just want to come along and cheer the Jubilee Wanderers on – we want you too!!! Wear anything you’re comfortable in (or if it’s your lunch break come in your work clothes) add something orange and then rock it out to some funky tunes! Seniors Week is an opportunity for Queenslanders of all ages to join together and celebrate the valuable contributions of older people. We just want to get all members of our community and all ages together in one big dance off! Busy Beats is a newly established, Brisbane based provider of fitness and dance programs for primary schools. In the coming months, Busy Beats will be expanding to also offer adult fitness programs. Alyssa is absolutely thrilled to have been asked to choreograph and help get the Brisbane community together for Seniors Week in such an innovative way! Based in the Western suburbs of Brisbane, Jubilee Community Care is enriching later life by providing personalised services, community connections, education and support for older people and their families. Jubilee is small, local and takes great pride in their highly educated support workers who are individually matched to their clients. The Jubilee Wanderers is a group that keeps our seniors active in our community. One week they might be wine tasting, the next visiting animals or having fish and chips on the beach… Life is never boring for the Jubilee Wanderers. The oldest Wanderer has just turned 100 and will be flash mobbing with her crew! RSVP through our Facebook Event!